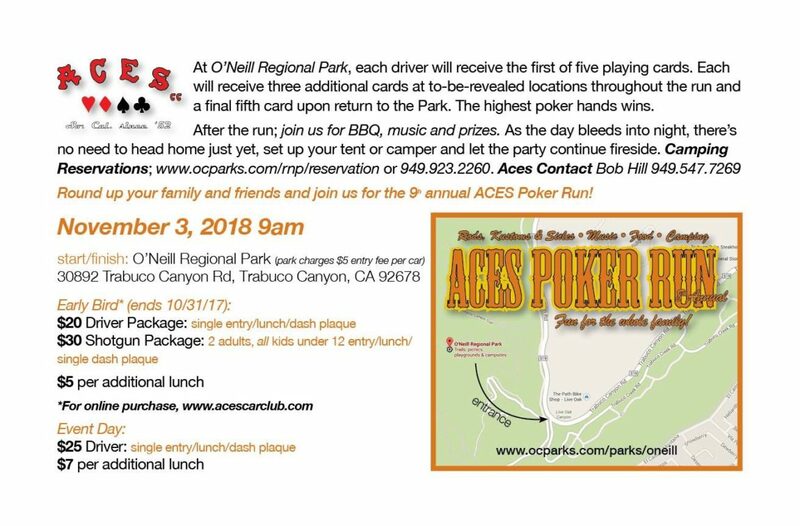 November 3, 2018: ACES Car Club Poker Run, located in one of Orange County’s best-kept secrets. ACES Car Club is once again hosting their annual Poker Run. This event is open to pre ‘65 traditional rods, customs & classic bikes only, and being held in scenic Trabuco Canyon, Orange County. The start/finish line is O’Neill Regional Park, 30892 Trabuco Canyon Rd, Trabuco Canyon, CA 92678. In total, a 43 mile tour. At O’Neill Regional Park, each driver will receive the first of five playing cards. Each will receive three additional cards at to-be-revealed locations throughout the run and a final fifth card upon return to the Park. The highest poker hands wins. After the run; join us for BBQ, music and prizes. As the day bleeds into night, there’s no need to head home just yet, set up your tent or camper and let the party continue fireside. To make camping reservations, visit www.ocparks.com/rnp/reservation or call direct 949.923.2260. 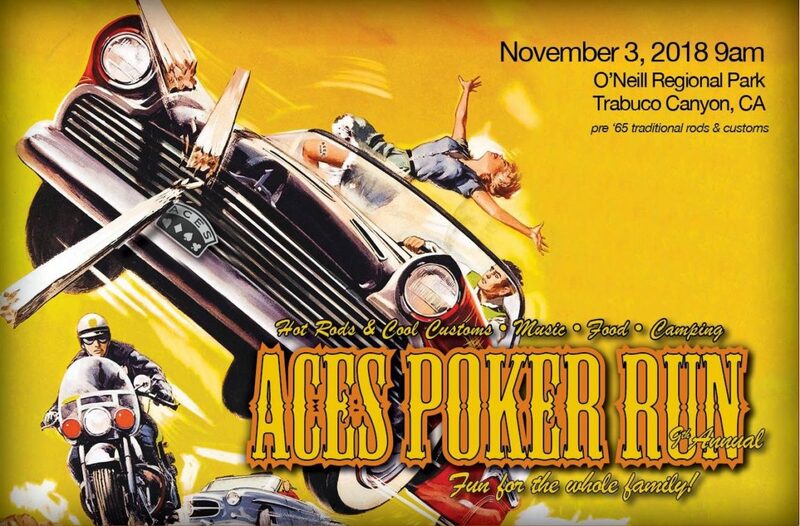 Round up your family and friends and join us for the 8th annual ACES Poker Run! Major discounts for early bird purchases. Event price does not included $5 park entry. Tickets available day of event do not reflect discounted early bird pricing.